Thunderbreak Regent joins Glorybringer, Stormbreath Dragon, and Sarkhan, Fireblood in a powerful new strategy for Modern. Skred you! Nicol Bolas, the Ravager rocked the Week 1 Classic! With 3 copies played in 3 different decks, Magic's biggest bad guy repped in multiple archetypes, too. Your puny little red men are no match for Giganotosaurus. It's a tough cast, though. Is there a legitimate reason to go GGGGG over Verdurous Gearhulk? When might you play Goreclaw, Terror of Qal Sisma? 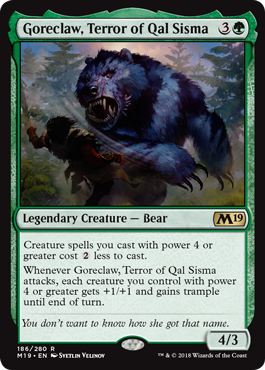 Goreclaw, Terror of Qal Sisma is the king queen of Bears! I know, I know... Goreclaw is not a 2/2 for 1G; but Bear it claims to be. Okay, okay... Let's get past the Vorthos on this card. What might make you want to play it... Or not? In a world of where Lightning Strike and Abrade are played in the most popular deck, three toughness is a bit of a liability on a four casting cost creature; at least one that isn't doing something absolutely card advantageous on the way in. Patrick speculates that the three toughness is a deliberate structural weakness in the card against red -- a weakness green doesn't usually have -- for other reasons. WHY Would You play Goreclaw, Terror of Qal Sisma? Easy: You want to get the drop on a seven-drop. Goreclaw costs four. Presumably you hit your land drop the following turn. That's five. Alongside Goreclaw's two mana-breaking ability, you can hit something like the new Darigaaz the next turn! Kind of need your three toughness four-drop to live for that to work out. Michael is not necessarily convinced. Among other issues, the best five-power [green] creature in the format [by his estimation], Steel Leaf Champion, not only comes down before Goreclaw most of the time... Even when you draw your creatures in the right order, Goreclaw won't help you cast it. Another new green monster maybe? Fine, Fine... How About Runic Armasaur Then? Runic Armasaur has a lot of awesome things going for it. Size-wise, this card is comparable to the ubiquitous Thrashing Brontodon. That's not a bad place to start. Runic Armasaur isn't quite big enough to stop Hazoret the Fervent, but five toughness is a big brick wall. Runic Armasaur is punishing to fetchlands, so may have more impact in larger formats. In Standard, it will prove quite effective against Evolving Wilds. But where Runic Armasaur will really shine? Walking Ballista! Bam! 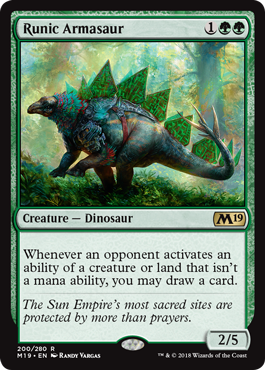 The best card in Aether Revolt is going to have a really tough time generating card advantage against this particular dinosaur. Speaking of dinosaurs, If Runic Armosaur is good enough, it may just make Thunderherd Migration good enough. Thrashing Brontodon, Ghalta, Gigantosaurus... There may be just enough dinosaurs to hit critical mass of thunder lizards.